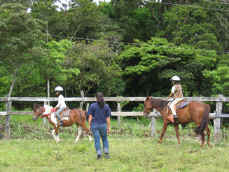 These are some pictures from when volunteering at Sabine's Smiling Horses started. We painted some horses using clay and any thing natural we could find. We held a volunteer program in March 2002. 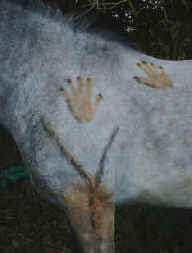 We were building a horse feeding roof in the field and made some action painting with my horses (we used clay and occre). Marie-Jacques was with me for 3 weeks and her ideas inspired us to do some nice Photos in the field. See also her feedback. Thank you very much for staying with me and helping improve things in my farm. 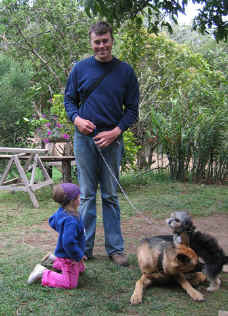 Scott and Serena were volunteering in 2004 on and off since they were our neighbors in exchange for some horseback riding adventures with us. for a few weeks in early 2005. 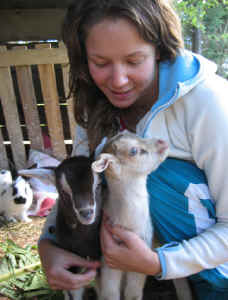 Laura had planned to stay with us for 5 weeks in 2004, then extended it to 8 weeks. 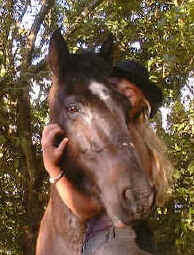 She came back after only 7 months in the Spring of 2005 and again in the Summer of 2006. 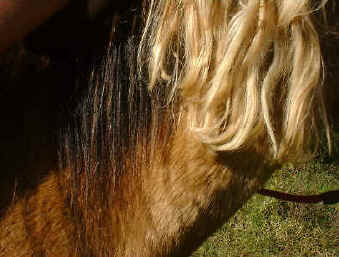 She helped train some of the horses and worked as a horseback riding guide. 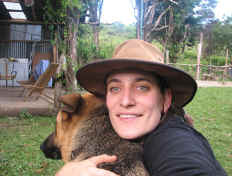 Kirstin volunteered in February 2006 in Monteverde. 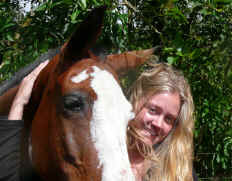 In the short time she was here she helped to develop our children's horseback riding lessons and vaulting program. 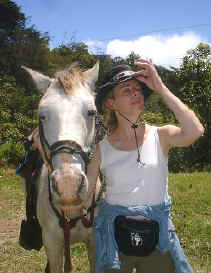 Kassandra stayed with us for 3 months in 2005 and helped us work with teaching children to ride. Not only the horses, but also children are the best feedback for the welcoming and warm place Sabine's Smiling Horses offers to volunteers. We work hard and we have a lot of fun too. She has 2 children now in Canada. 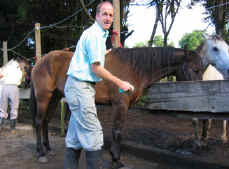 Dan stayed with Sabine's Smiling horses in Monteverde Costa Rica in March and stayed through May 2006. Pierre from France. 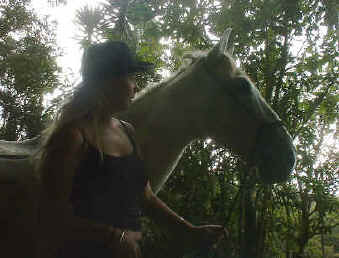 They have 40 horses at home and he fit perfectly into the Costa Rican horse world. Not only he did benefit from experiencing horsemanship at Sabine's Smiling horses, but also we started our 3 year old horse Salvaje, that I got as a yearling completely wild and did not buck once since we mount her. Thank you Pierre for sharing your knowledge with us and helping us. 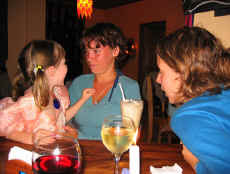 At the end of 2007 Claudia was here with us and she is one we want to keep forever at our place. She was a great person to share our time with and her riding skills were admirable. 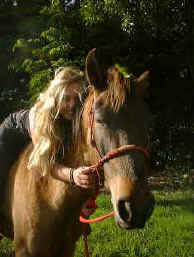 Always happy on the horse no matter how many hours in the saddle. 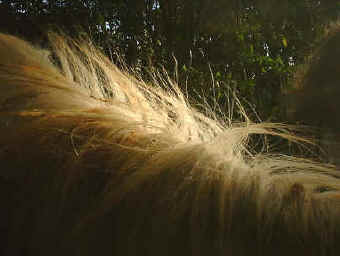 Read her story of her experience in Monteverde. 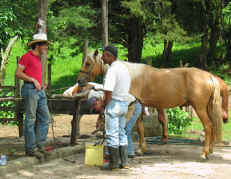 Best choice in Lonely Planet Costa Rica 2012: Sabine's Smiling Horses (Cell: 8385-2424, www...), ...This outfitter has been recommended by readers year after year.